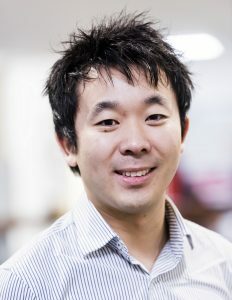 Today on the blog, we sit down with Dr Billy Wu of Imperial College to discuss 3D printing’s applications in research and education, how Imperial’s students are turning their 3D printed prototypes into business opportunities, and his team’s revolutionary new metal printing method. Was there a specific moment where you decided 3D printing was something you wanted to pursue? I’m a lecturer at the Dyson School of Design Engineering here at Imperial. I’ve actually been here for 12 years, since my undergrad. I’m in design engineering now, but I started out in mechanical engineering, so my training was very much learning to make things on the mill, the lathe, and similar technologies. We learned the joy of good engineering drawings, tolerances, etc. When I was doing my PhD, it was quite experimental, so I had to make a lot of components for rigs and so forth. While I could make them out of metal, it was far easier to 3D print them. It was around that time that the price of 3D printers had come down, and I didn’t always need things to be in metal, so for me, it was a far easier technology to use in terms of the speed of production. That’s something that stuck with me, and now that we run a design course here at Imperial, the emphasis is on manufacturing as quickly as possible. The ethos of ‘fail fast’ is a good one! You can spend several weeks manufacturing a component only to find it’s not the one you want, so being able to manufacture extremely quickly was extremely attractive for research and teaching. Since then, we’ve increased our 3D printing capabilities. We have a range of plastic 3D printers that we use with the students, including FDM and polymer jetting machines, along with more exotic printers, like composite 3D printers that can print in carbon fibre. We also run a metal additive manufacturing facility for high-level research, such as manufacturing components for medical orthopaedic implants, aerospace components and so forth. How did you move from using 3D printing solely for your own research to using it with students across the whole university? One of the things I help to run here at Imperial is the Imperial College Advanced Hackspace. One of the initial problems with 3D printing for students was the barrier to entry. If a student had an idea and wanted to create a prototype, it was very difficult to get into the workshop if it wasn’t timetabled or part of their curriculum. We wanted to break down those barriers, so we started our Hackspace, which allowed any student at Imperial to access our manufacturing capabilities — totally free. Since then, it’s really taken off. The college have brought into it and are allowing us to grow our capabilities, as they have seen the output. We also run a joint Masters with the Royal College of Art called Innovation Design Engineering (IDE). In that course, about 60% of the students go on to start their own spin-off companies. They come up with a cool idea, they prototype it, and then pitch it at places like the Venture Capitalist Challenge, which is like a Dragons’ Den competition, or do a Kickstarter project. The college have really seen the value of rapid manufacturing, and that’s why they’ve invested more and more in it. What’s the learning curve like when students try this for the first time, especially when it comes to making their files printable? It depends on who you talk to. Some students are very experienced with CAD, but are still designing components with traditional manufacturing in mind. What frustrates me is when students come to me and want to print, for example, a cube. They haven’t quite realised that they can do all these other things with the technology. At the moment, it’s just seen as a like-for-like replacement for traditional manufacturing, which means that we’re not getting the most out of the technology. If you want a real breakthrough in additive manufacturing, you need to design for additive manufacturing. You might utilise optimisation algorithms, where you could say “I need a component to hold these two things together at these two points. Create me a structure that supports the load and is as lightweight as possible”. We do a lot of computer-aided design like that here, where we let the computer decide what shape a component should be, rather than saying (for example), “I’m going to have a 10 degree draft on this component because I think it looks right”. A computer might arrive at a solution that’s non-intuitive, because it tries millions of options before identifying the optimal one. We often say 3D printing speeds up the manufacturing process. While it does speed up the actual manufacturing, the pre-processing can actually take quite a long time, so if you can get a computer to do that for you, it’s cheaper and far more effective. Since 3D printing launched at Imperial, what have been some of the real success stories you’ve seen? One project that was very cool involved developing a new 3D printing process. The concept was that if you go out to a distant place (say, the moon!) and want to manufacture something, you don’t want to be hauling bricks with you — you want to be making use of the local resources. One of our IDE students, Markus Kayser, designed what is called a ‘solar sinterer’ for this purpose when he went out to the Sahara. This printer was essentially a box with a big optical lens that focused the light of the sun into a specific point that he could use to melt the sand. By moving that point around, he could use the sand to effectively 3D print glass, allowing him to make things like bowls, art pieces… You could even make buildings out of it! People often talk about the circular economy, where we reuse our waste products, and 3D printing has a large role to play in that, particularly with the use of local resources. If you’re developing a mine, for example, and you 3D print the building you need, that makes more sense than shipping out the materials to a remote location. It’s also about reusing the available materials. I run a research group here where we try to develop new types of 3D printing with this as one of the long-term goals. We do a lot with direct metal laser sintering, using a Renishaw AM250, but we want metal printing to be more consumer level, so a different sort of technology is needed. We’ve just published a paper on a new type of metal 3D printer which is similar to an FDM machine, so it can be a desktop unit. The process is similar to electroplating, where voltage is applied in a plating solution , moving the metal in the bath onto an object. This process has been around for decades, so we know how to put metals down at room temperature very easily. What we did was take a syringe, fill it with the plating solution (copper sulphate in this case), and used it as a 3D printer, manipulating the metal into the desired structure. The advantage of this is that it’s additive — as you can print metallic structures by turning the potential on and off — but it’s also subtractive, as by switching the potential from positive to negative, you can actually corrode the metal back into the solution to further shape the part. I always use the example that if you ever went up to space, you’d want to 3D print a spanner, but you’d also want to be able to reuse that material. With our method, by reversing the potential, the material just goes back into the solution, so it can be reused. That creates a circular economy, where waste products can be reused. This process also allows us to use multiple materials (copper, nickel etc.) so we can start printing electronic circuits, or devices such as sensors. I think with 3D printing, the next step is to add some intelligence to it. For example, I think we will see people printing parts with things like strain sensors inside, so if you are not sure how a part is being loaded, the sensor will tell you when it is close to failure and needs to be replaced. Another example would be a valve designed to let water out in spaces like a greenhouse, where it opens automatically if the temperature becomes too hot. In other words, we build the functionality into the materials, and the components start to become smart! I think when the design tools become more advanced, we will start to design not just for 3D objects, but 4D objects like this that evolve over time. With all this new technology in development, how do you see things evolving across the industry over the next few years? One of the risks with 3D printing is that people lump all of the technologies together, when in fact, there’s considerable diversity. 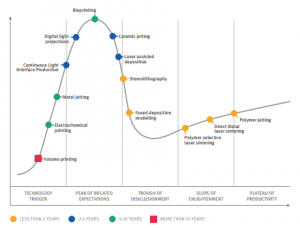 If we consider the newer 3D printing technologies in light of the Gartner Hype Cycle, we’re still at the ‘peak of inflated expectations’ where everyone is excited about the possibilities, right before we enter into the ‘trough of disillusionment’. FDM and SLS went through this process, where people wanted to 3D print everything, only to realise the technologies couldn’t compete against injection moulding. But eventually we realised we could print the moulding tools and fixtures, which makes sense, because those cost a lot of money to manufacture. When this happens, we reach the ‘plateau of productivity’, where the technology becomes really useful. I think different 3D printing technologies are at different points on that curve. Technologies like FDM, SLS and DMLS are already approaching that ‘plateau of productivity’, but I feel others, like bioprinting, are overly hyped. However, I think they will eventually find niche applications where they can deliver genuine value and actually make a real difference.